Rathlin Island sits off the north coast of Ireland, its closest point is approx. 2.25 miles from Fair Head . It is also the closest point to Scotland and is 11 miles from the Mull of Kintyre . It is roughly seven miles in length and covers a total area of 3500 acres . Because of the closeness to Scotland it has often been at the centre of many an argument over ownership . It was finally settled in 1617 by a simple test that had also been applied to the Isle of Man, if a snake or other poisonous serpent could survive on the island it was taken as being part of the mainland . If it died then Ireland was the owner, Ireland finally was declared the true owner . Rathlin was probably the first Irish island to become inhabited, it is presumed man arrived here somewhere between 6000 - 5000BC from Scotland . It can also claim to have a gruesome history as it was the scene of several major massacres of the population . Another claim for fame is that it is surrounded by some of the strongest tides, supported by the large number of boat wrecks lying in the waters around its coast . By 2500BC the islanders had built up a thriving export business in axes made from porcellanite . The raw material was found on the western side of the island and the finished product was mainly used for forestry type work . Although the remains of the axe-factory are inaccessible, information can be obtained about Rathlin's history at the Boathouse Visitor Centre . Another rare material found in the limestone cliffs was flint and this contributed to the prosperity of the island, however things changed in 1800BC with the appearance of copper axes from Spain . Folklore is very much in abundance here on the island, one example is the story of the Enchanted Island . This island is supposed to appear from the sea once every seven years . The story says that if you lift some soil or a pebble from under your feet and can throw it onto the island then it will never sink back under the sea again . The island is associated with innumerable famous figures from Irish mythology such as the Tuatha de Danaan . In early Christian times, St. Columba spent time in Rathlin, and perhaps the most famous of our visitors was Robert the Bruce, who hid here after being defeated by the English at Perth in 1306, during his struggle for the Scottish crown . It was in a cave in Rathlin that he drew inspiration from a spider which tried seven times to bridge a gap between two rocks in order to complete its web, until Bruce himself drew fresh courage to make a further attempt at the crown, eventually succeeding at the Battle of Bannockburn . Bruce's cave is unfortunately only accessible by boat, but Rathlin can nevertheless boast the most famous spider in history . In 1846, with a population of over 1000 on the Island , nearly 500 people left the island in search of an easier life across the Atlantic . It was at this time the potato famine threatened the very existence of many rural communities throughout Ireland. 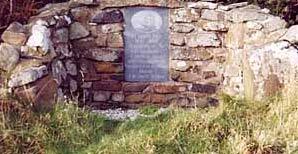 A commemorative stone has been erected to their memory high above Church Bay. In more recent times, Rathlin's shores have been dotted with wrecks, thrown onto the rocks during storms. One of the most famous was HMS Drake, the flagship of the British Navy during World War One, which was torpedoed, and sank in Church Bay. In extraordinary feats of engineering, several spectacular lighthouses were built amongst the rocky cliffs of the island, and the history of their construction is explained in detail at the Boathouse Visitor Centre . The East Light, high above Bruce's Cave at Altacarry Head, has been flashing a warning to mariners since 1856 . It is the oldest of the lighthouses and has since been automated . The particularly impressive West Light was built between 1912 and 1917 and also required the building of a provisional pier, a steep cable tramway from the pier to the cliff top and the road across Kebble.The light at Rue Point has operated since 1921, is located at the southern tip opposite Fair head and is only 35 feet above sea level. The East Lighthouse on Rathlin Rathlin has attracted some famous visitors in recent times, notably Guglielmo Marconi who was contracted by Lloyd's Insurers to install a wireless link which would allow swift announcements of successful trans-Atlantic crossings by Lloyd's ships. On July 6th 1898 Marconi and his associates successfully transmitted the first commercial radio signals across water from Rathlin's East Lighthouse to Ballycastle on the Northern Irish mainland. There is a commemorative plaque at the harbour . The early owners of the island were the Gage family and they built a large Georgian House for themselves . It was known as the Manor House and even after the Land Acts of the last hundred or so years the Gage family remained there . They were still in residence until a few years ago when the house was handed over to the National Trust . As the owners of the island they were entitled to rent from the rest of the population . The gathering of Kelp was one of the ways that paid the rent, there were up to 150 kilns in operation at one time and this industry continued up to the 1930s . Seaweed was collected and put into stone kilns and burned until it turned into a "boiling mass". Kelp was used to produce soda and iodine. Rathlin was also famous for smuggling - poteen, rum, brandy, tobacco, lace, etc . Near Ushet Port on the south-east tip of the island is a building with recesses in the walls, said to be used for contraband . The Coastguard filled in Ushet Port with stones to make it unusable for the smugglers . Rathlin's winds were used to drive 3 turbines, Conn, Aedh and Fiachra to generate two-thirds of the Island's electricity . Prior to their construction in October 1992 there was no mains electricity on the island. The turbines are named after the three sons of the mythical chieftan Lir . According to legend his 4 children were turned into swans for 300 years by their stepmother and roamed the seas around Rathlin . To date only two of the turbines have ever operated . At the moment the wind turbines are unused, a new underwater connection from the mainland now supplies the island's power . Rathlin's most recent famous visitor was Richard Branson, whose hot-air balloon crashed into the sea off Rathlin in 1987 after its record-breaking cross Atlantic flight from Maine, USA. Richard Branson and Per Lindstrom were rescued from the sea a few miles northwest of Bull Point, Rathlin, where they were taken to safety. Richard Branson later returned to Rathlin and presented the Rathlin Island Trust with £25,000 towards the renovation of the tithe barn at the Manor House . Fate may have played a part in Richard Branson's landing, Richard left Maine in America and came very close to landing on Rathlin . All those years ago, the people of Rathlin left for America and most of them settled in and around Maine . Perhaps Richard carried the spirits of those people back with him and they guided him on his journey . It is up to you to decide if fate did play a part.